It is a crucial time for Australia’s climate policy framework as Australia’s carbon price framework turns 2 years old. The Abbott Government is hell bent on ‘axing the tax’ – Australia’s fixed carbon price which was due to morph into a fully fledged Emissions Trading Scheme in 2015 with links to the European and Californian schemes. But the Liberal National Party Government elected September 2013 lead by Prime Minister Tony Abbott has sort to go far beyond their slogan of ‘axe the tax’ to destroy any related policy initiatives. This includes abolition of the Climate Commission already accomplished, the Climate Change Authority and clean energy programs such as the Australian Renewable Energy Agency, the Clean Energy Finance Corporation, and the Howard Government initiated Renewable Energy Target. After two years of effective operation of the carbon tax a number of electors took the opportunity to celebrate the 2nd anniversary of carbon pricing and current climate laws with their elected representatives. 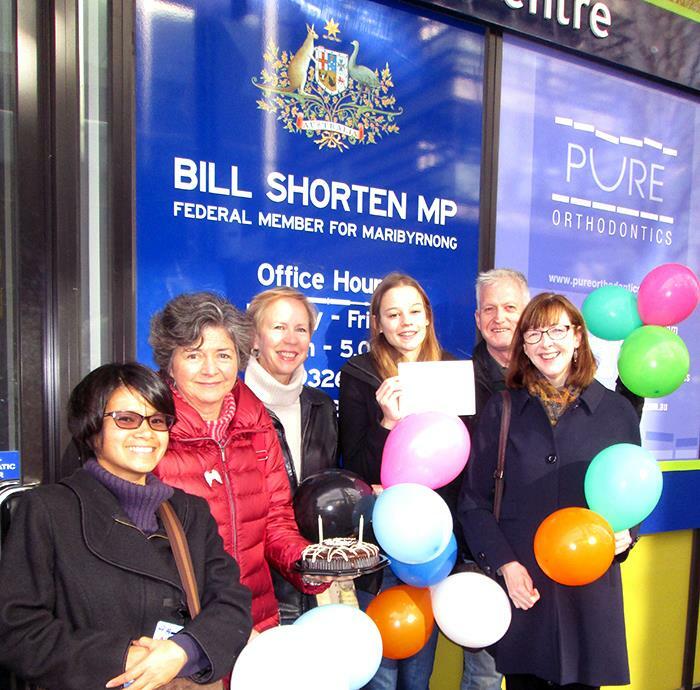 The Australian Conservation Foundation events were small scale and informal, sometimes with the representative present and sometimes just with office staff or held outside the electoral office. Within the span of 2 days over 2,000 people also sent an e-card to their local MP as part of the event. It was a gentle reminder that people overwhelmingly supported action on climate change according to the Votecompass survey at last years election, and continue to support carbon pricing and clean energy according to several recent surveys and opinion polls. I first met and interviewed my local MP, Kelvin Thomson during the election campaign last year who has proven to be a strong supporter of carbon pricing and climate action. 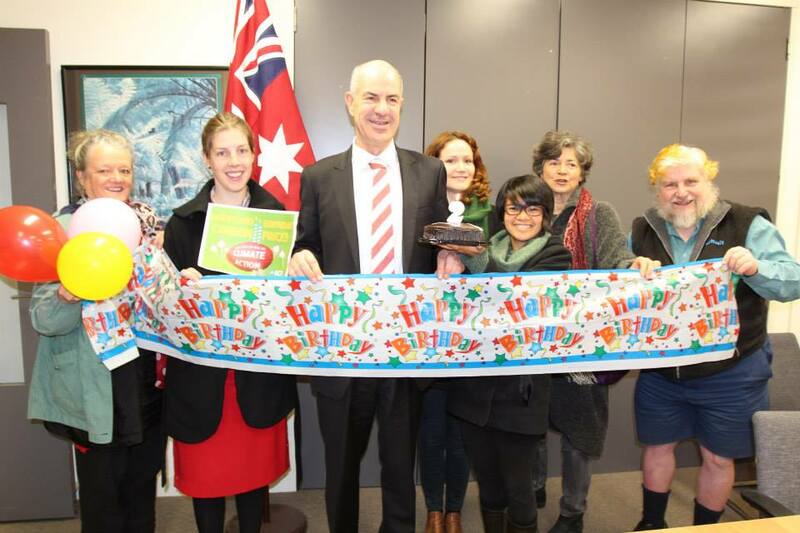 On a cold and blustery Thursday morning Thomson welcomed us into his office where we presented a birthday cake and had a brief opportunity to discuss the importance of carbon pricing and the clean energy mechanisms and their current status in the Senate, followed by a photo opportunity. The legislation to abolish the carbon tax, the Climate Change Authority and Clean Energy Finance Corporation have all passed the Government controlled House of Representatives and are now before the Senate. The senate was established under the constitution as the State’s House, but has overwhelmingly operated under traditional party lines. No party has majority control in the 76 member house. The Coalition has 33 members, Labor has 25, with the crossbench being made up of the Greens 10, Palmer United Party 3, and 1 each from the Motoring Enthusiasts Party, LDP, DLP and Independent. The Government needs at least 6 votes from the crossbench to pass legislation. Here is where the Government needs to refine their negotiation skills on climate policy, in fact for any of their legislative agenda. Ricky Muir has formed a voting block with the Palmer United Party making their 4 votes crucial for legislative changes. The Palmer United Party campaigned against the carbon price at the election, but most of the party policies were more populist and conservative centrist. Clive Palmer’s inconvenient truth moment on climate change with Al Gore was an opportunity for creating political space for his new party with a policy that throws bones in all directions. It now seems that Motoring Enthusiasts Party Senator Ricky Muir, a former timber worker, is championing continued funding for ARENA which the Government announced in the budget it has decided to try and wind up. While the Senate deliberates and negotiates on elements of the climate change framework, Pitt and Sherry released the latest CEDEX report on key greenhouse gas emission trends in Australia for the electricity sector. Even in the first 6 months the signs were there that the carbon price was having the required impact. The total fall in demand over the two years since June 2012 has been 4.6%, or 8.7 TWh in absolute terms, while the total fall in emissions has been 10.4%, or 18 Mt CO2‐e in absolute terms. Changes in electricity have always been of great importance to the outlook for Australia’s emissions. Until 2008 electricity generation was the largest driver of growth in Australia’s emissions. Since then it has been the largest source of emissions reduction, almost completely offsetting increases from other emission source categories. Hydro power has been the big winner since the carbon price was enacted, with Tasmania benefiting most. But with abolition of the carbon tax Hydro Tasmania has already announced more than 100 jobs are threatened due directly to repeal of the carbon tax. Electricity generation from gas turbines has been stable over the last two years but is predicted to fall as generators roll over into new contracts with higher gas prices. Output from wind and other renewables has been steadily increasing, boosted by the Renewable Energy Target and investments made by ARENA and CEFC. Wind generation has increased steadily since June 2012, with each month’s annual output higher than the month before, driven by the continuing steady commissioning of new windfarms under the LRET program. Total wind generation in the year to June 2014 was 8.43 TWh. As has been reported elsewhere, the last week in June was a very big one for wind generation, as strong winds blew almost continuously across all four south eastern states from Monday until the following Sunday morning. Peak 30 minute trading interval generation occurred, perhaps fittingly, at 9 pm on the Wednesday evening, a few hours after the Clive Palmer/Al Gore press conference, and was 17% higher than the highest 30 minute peak recorded prior to June. Over the six full days, Monday to Saturday, wind generation supplied on average 14.5% of all generation in the four states, and 10.7% for the whole NEM, including Queensland. The highest 30 minute share was 21% at 5 am on 27 June. Proportions of generation were very much higher than this for the whole six days in South Australia. The greatest significance of these figures is probably the demonstration that the NEM is sufficiently robust to be able to accommodate such large shares of wind generation, with no effect on the supply of electricity to consumers. Total power generation in the last year is down to black coal 50.7%, brown coal 22.3%, gas 12.7%, hydro 9.6% and wind 4.7%. This is the lowest shares of both black and brown coal, and the highest shares of wind sincce reporting began in 2006 according to the CEDEX report. 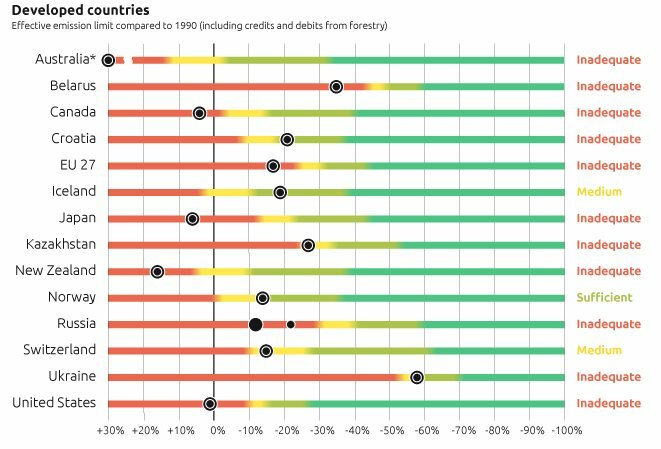 Arguments have been put forward that carbon pricing caused large rises to electricity bills, but most of the price increases have been due to electricity generators and transmission businesses gold-plating the network by building unnecessary poles and wires and other infrastructure based upon poor predictions and modelling of ever increasing electricity demand. The local example is the proposal to upgrade the Brunswick Terminal Station that has been actively campaigned against in Melbourne’s inner north. A Four Corners investigation by Stephen Long – Power to the People – broadcast on Monday 7th July 2014 also highlighted the growing transition to renewable energy. The traditional electricity generators are fighting this transition through opposition to clean energy and to reduce the effectiveness of the Renewable Energy Target to entrench their outdated business and electricity generation and distribution model. Minister for the Environment Greg Hunt argues that carbon pricing should be repealed as it is ineffective, yet it has helped reduce electricity sector emissions by 18 million tonnes (or 11%) in just 2 years advises Professor Mike Sandiford, a Director of the Melbourne Energy Institute at the University of Melbourne. This all comes as Lord Deben, who served in Prime Minister Margaret Thatcher’s cabinet and definitely on the conservative side of UK politics, soundly criticized Australia for repealing carbon pricing accusing Tony Abbott’s government of ‘recklessly endangering’ the future on climate. So happy 2nd birthday carbon pricing. You may have inspired emissions trading schemes in China, but it seems under the toxic entrenched interest and ideologically driven politics in the Coalition you may not live to see your third anniversary. 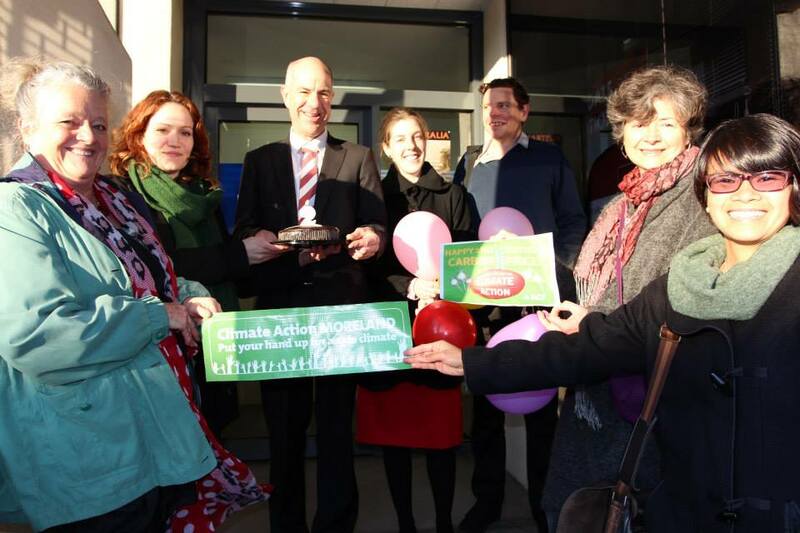 Australian Conservation Foundation Facebook Album – Happy 2nd Birthday Climate Laws! Entry filed under: Event, news, Policy. 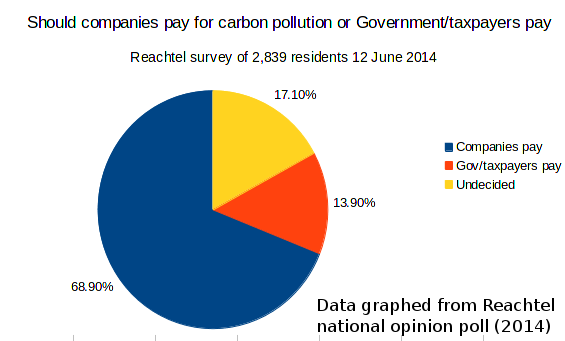 Tags: Australian Conservation Foundation, carbon pricing, carbon tax, Kelvin Thomson.